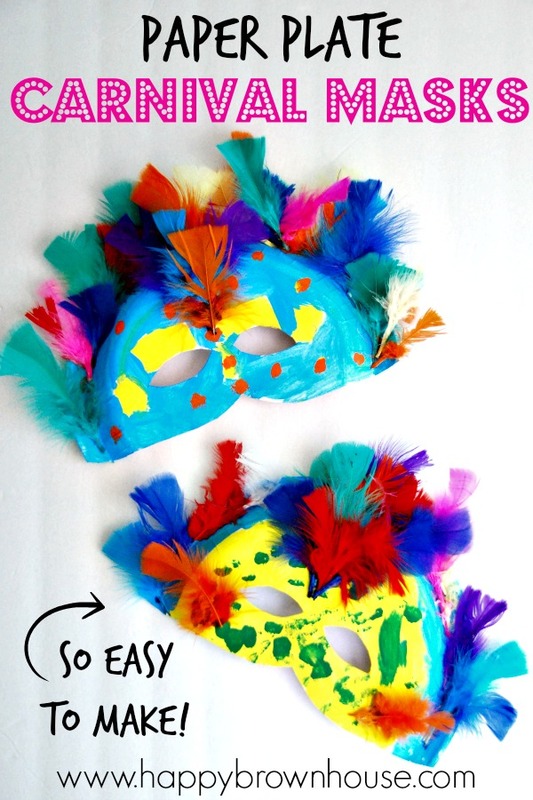 These Paper Plate Carnival Masks are perfect for teaching kids about Rio Carnival, Brazil, and the Rainforest. During our homeschool study of the rainforest, we read about Rio Carnival in Brazil and wanted to make our own colorful masks. Carnival is always celebrated the weekend before the beginning of Lent, similar to Mardi Gras. While we don’t celebrate Carnival or Mardi Gras, it was fun to have our own family fun night of making colorful, feather-filled Carnival masks, reading rainforest books, and watching the Carnival themed movie for kids, Rio during our rainforest homeschool unit study. During our rainforest unit, the boys and I discovered that everything is more colorful in the rainforest, especially the birds, so our masks mimicked the bright rainforest birds and the main characters in the movie, Rio. Using scissors, cut the bottom portion of the paper plate off and cut holes for eyes. 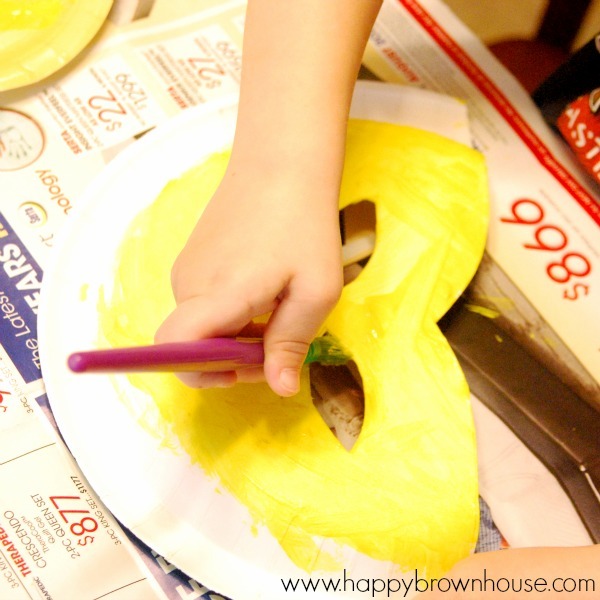 Let the kids paint the bottom of the paper plate in bright paint colors. If you want to attach a string, use small elastic and attach it to the mask before attaching feathers. Poke holes on each side of the paper plate, thread the elastic through and knot it. Measure your child’s head for the correct tightness. Glue feathers around the rim of the plate. When our masks were finished and dry, we read some of our favorite rainforest books for kids and watched the movie Rio as part of our family movie night. The kids ran and got their Paper Plate Carnival Masks to wear during the parade scenes. 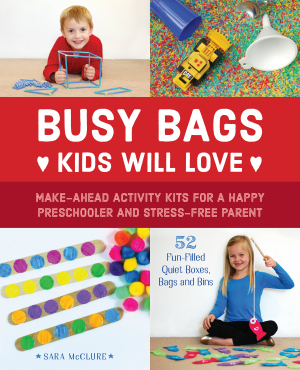 It was a super fun night and the kids have enjoyed playing with their masks since. 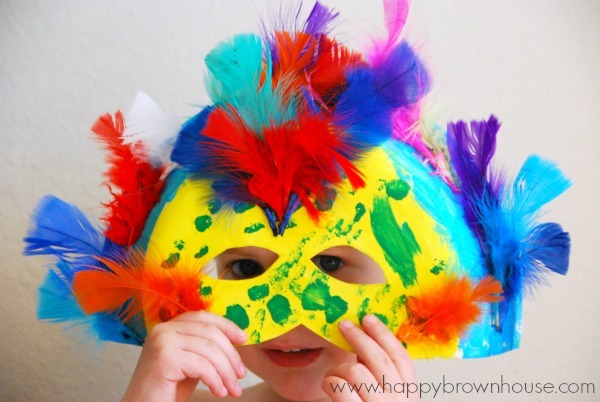 These masks would be a fun Carnival craft, Mardi Gras craft, or even a bird mask craft during a bird unity study. If you make these, be sure to let us know and share your mask creations with us! These are very cool and turned out great!